The Portapump was originally designed for refueling 45-gallon drums in remote locations for organizations such as UNICEF. The tubular “open” frame allows operators to observe all parts and couplings during operations, making servicing much easier. 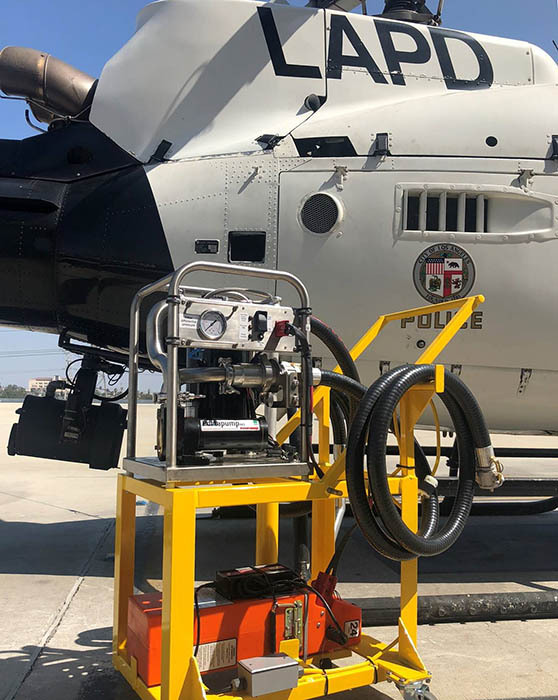 The Portapump is perfect for any application that requires rapid fueling and de-fueling of helicopters and fixed-wing aircraft (such as the Twin Otter, Caravan, Pilatus, and similar turbine aircraft). This unit can pump 100 liters (26.4 gallons) of fuel per minute. 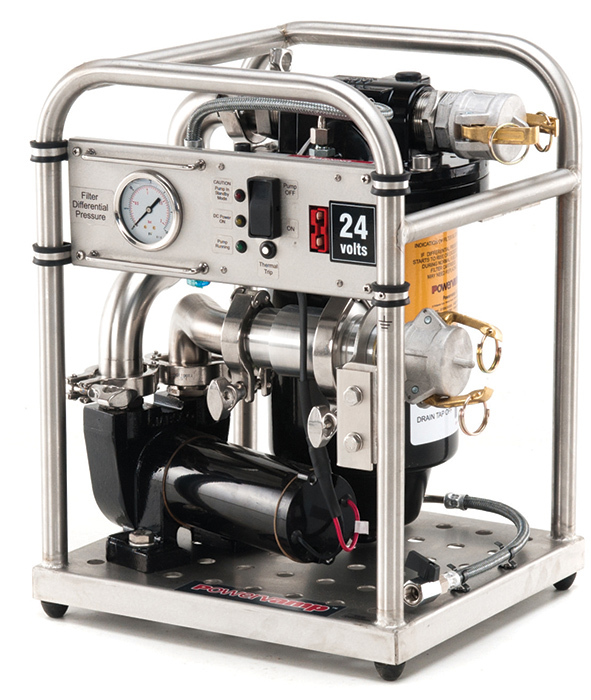 The Portapump unit is a rugged, all-weather fuel pump designed for the rapid fueling or defueling of all types of aircraft or vehicles using jet A1 or diesel with a flash point above 37ºC. It is designed to be easily transported by aircraft, helicopter or vehicle. Able to be carried by one man, it uses a powerful 24–28 volt DC motor direct coupled to a high-speed pump with phosphor bronze sliding vanes. The power source can be any 24/28 volt supply such as a portable GPU, vehicle battery or aircraft DC bus. Alternatively a 110/220 volt domestic mains supply can be used with a DC voltage converter. Fuel drums or containers that would otherwise require a settling period after transport to allow fuel/water separation can be pumped immediately. 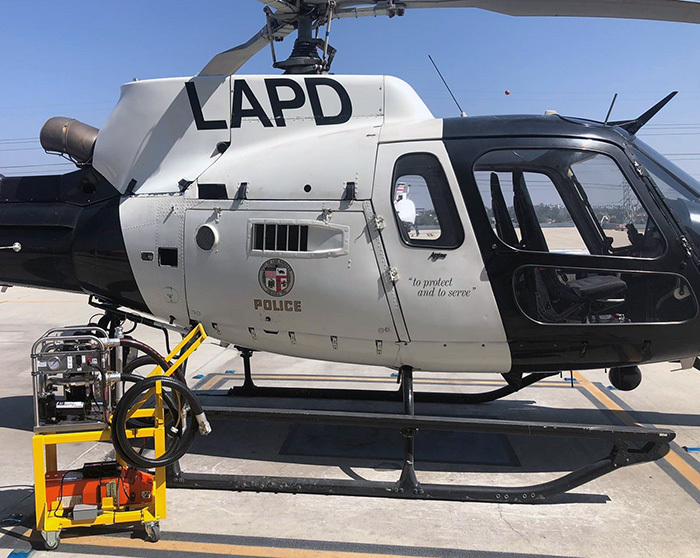 Fuel drained from aircraft, that would otherwise have been discarded, can safely be re-used once passed through the Portapump. An inlet non-return valve prevents drainback (siphoning) and maintains the back pressure to allow activation of the pressure operated switch that shuts off the pump motor. Normal pumping is indicated by a reading of approximately 5 PSI on the gauge. Progressive filter blocking is indicated by a gradual rise in differential pressure. At approximately 15 PSI the coalescer filter cartridge should be removed and replaced if necessary. A drain tap is fitted to allow any collected water to be removed daily. All pipework and fittings are alloy or stainless steel with ‘Camloc’ quick release fittings to give rapid connect/ disconnect of inlet and outlet hoses. Power requirement: 24–28 volt DC, 14 amps peak.